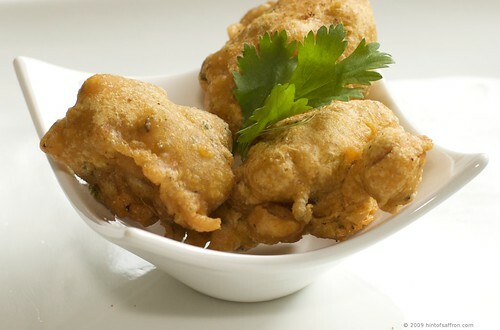 Spicy vegetable pakoda (or vegetable fritter) is one of my favorite appetizer. The are made with chickpea flour (known by the name of besan). They are spicy and are made with various herbs and spices. Depending on the region of India it is from, different spices are substituted or added. Coriander powder, black onion seeds, carom, fennel seeds etc are added depending on the region of the country it is made in. When I used to live in Minnesota, three of my co-workers and I used to cook a ethnic meal every quarter in the company we used to work for. We used to cook Indian, Vietnamese and Indonesian appetizers and entrees and finish off with an American dessert at the end. It became so popular, that even people who had never tried ethnic food enjoyed the food. We used to make the appetizer in the company’s kitchen using fryers and the entrees were made the previous night at home. The event became so popular that we were featured in the Star Tribune, the local newspaper. 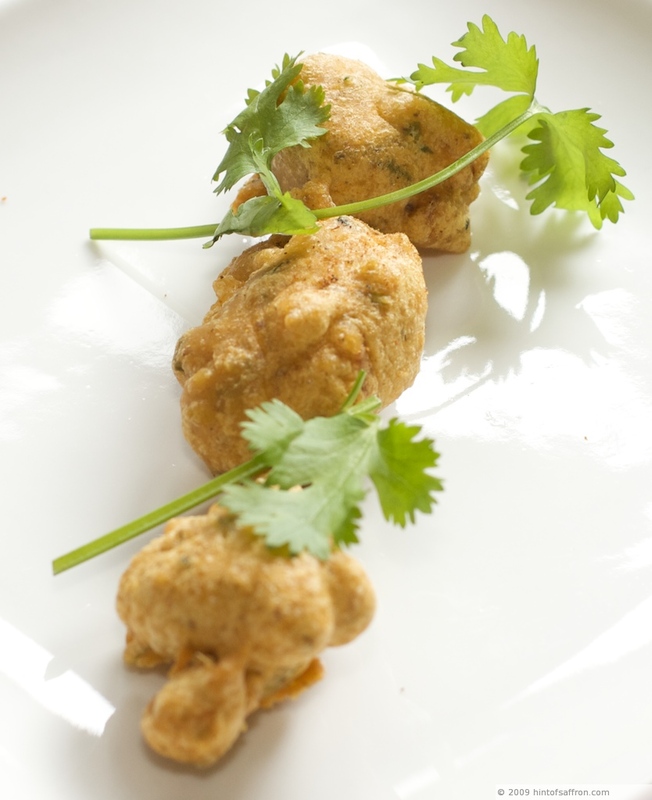 The best part of making pakodas is that they are very easy to make and very versatile. You can use all kinds of vegetables with the batter and fry them. Feel free to customize according to your taste. If you like them spicier, use habanero chillies. Use different cooking oils (indicated below) to give a different taste. My 7 year old daughter helped me with the layout of the finished recipe. Out of the various photos, it just so happened that her photo layout turned out to be the best! I am really proud of her. The vegetable pakodas (or fritters) are a very tasty appetizer. They can be eaten as is or dipped in cilantro and mint chutney or sweet and spicy tamarind chutney. They can be paired with black Indian tea or ginger and cardamom chai or even a good red wine! They can be eaten as a snack or as an appetizer before a meal. They are very versatile. You can substitute different vegetables like scallions, baby spinach, paneer (Indian cheese), etc. Also, I used peanut oil to fry them. Oils with high ‘smoke points’, in other words, those which do not break down at deep frying temperatures, are best. Peanut oil, safflower oil, sunflower oil, and canola oil are some good choices. 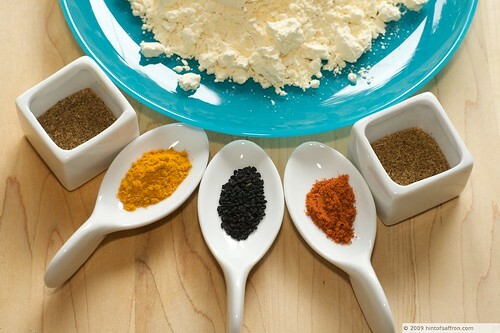 Combine all the above ingredients in a bowl and mix thoroughly until it is lump free. Let batter sit, covered, at room temperature for 20-30 minutes. Heat the oil in a fryer until it is very hot (375 ° F) or on a stove on medium heat. Test by adding a spoonful of batter. Once the oil is ready, gently add few spoonfuls of batter at a time and deep fry till golden brown. Fry 3-4 minutes on each side. Transfer the pakodas (or fritters), using a slotted spoon, to a paper towel lined plate.